Ever since the installation of Minister Tina Joemat-Pettersson as Minister of Agriculture, Forestry and Fisheries in 2009, we have had a growing number of statements and questions over the levels of black ownership, empowerment and transformation in the fishing industry by members of government, including the Portfolio Committee on Fisheries. What is apparent is that the department of fisheries and the Minister simply don’t know or understand the fisheries economy of this country. The institutional meltdown at the department of fisheries has contributed greatly to the lack of any discernible information on, analysis or performance measuring of our commercial fisheries. Just consider the utter nonsense that was published as “data” from the evaluation of the Cluster C and Cluster D fisheries – and the millions of rands that was wasted on that useless and error-ridden data. Without accurate and reliable socio-economic data it is impossible to properly regulate commercial or recreational fisheries. Feike has over the years invested substantial resources and energy into understanding the socio-economic relevance of our commercial fishery sectors. In 2008, we published an in-depth analysis of the socio-economic profiles of some of South Africa’s most important commercial fisheries. In addition, we monitor the total and individual fishery sector values on an annual basis based on the average landed values of the principal target resources. Here are some of the more significant headline statistics on fisheries. In 2006, the commercial fisheries landed approximately 630 000 tons of fish worth an estimated R4,4 billion. By 2010, some 745 000 tons of fish was landed worth an estimated R5,4 billion. The hake deep-sea trawl fishery has consistently been South Africa’s most important commercial fishery, accounting for 53% of the total value of the commercial fisheries. The small pelagic fishery, comprising pilchards and anchovies, has consistently been the largest fishery by volume, accounting for more than 550 000 tons of fish in 2010. If one considers the significant level of social transformation of the commercial fisheries since 1994, it ought to serve as the benchmark of black economic empowerment and social transformation for most of our economic sectors. Whereas black ownership of the commercial fisheries was almost non-existent in 1994, with quotas divided amongst some 400 operators, by 2005 (when long term commercial fishing rights were allocated), more than 3000 fishing rights were allocated with black ownership of fisheries at 60.9%. Between 2001 and 2005, the commercial fisheries increased employment numbers from approximately 29 000 to more than 43 000. And South Africa’s most valuable and important commercial fishery, the hake deep-sea trawl fishery, has led by example. In 1994, of the 21 quota holders, black ownership was measured at less than 0.5%. Five quota holders shared 92% of the catch allocation. By 2001, black owned and managed quota holders controlled 25% of hake trawl catch. The number of right holders more than doubled to 53 quota holders and the quota held by the five largest quota holders was reduced to 74%. By 2005 when the trawl fishery was allocated 15-year long commercial fishing rights, black owned and managed quota holders controlled 43% of hake trawl catch and the five largest quota holders controlled a further reduced 70% of the catch. The fishery directly employs some 8000 people and 75% of all hake deep-sea trawl skippers are black. Right holders in the trawl fishery employ an average of 70 persons per 1000 tons of fish; while their international counterparts employ about 40 persons per 1000 tons of fish. Without a cogent and rational understanding of the socio-economy of the fisheries sector as a whole and of individual sectors, how is the department possibly going to even begin preparing for the allocation of commercial fishing rights in 13 commercial fisheries in 2013 and 2015? How does the department even begin to develop policy to manage the next round of fishing rights allocation without having monitored and evaluated performance of fishery sectors and right holders against the legally binding policy objectives set out in each of the fishery policies? What to do with a Problem called Abalone? Based on anecdotal evidence from fishers along the coast, some recent (conservative) research analysis – to balance the anecdotes, the near weekly reports of significant abalone busts by the South African Police and conversations with fishery control officers, there is little doubt that abalone poaching continues unabated. The recent arrest of 19 members of a local syndicate appears to have done little to dent the poaching thirst. Then of course we know that the department of fisheries is not particularly interested in curbing poaching. They continue to rely on the proceeds from the sale of confiscated abalone to fund the administration of the Marine Living Resources Fund and fishery control officers are not permitted to work after 4pm or on weekends! The department also lacks the funds to implement any (even a half decent one) abalone anti-poaching strategy and continues to waste substantial funds on the “military veterans” that they use as additional “fishery control officers”. Now rumours are awash along the Overberg coast that the department’s abalone scientists are recommending the closure of two further abalone zones – Zones A and B, which will effectively close all abalone fishing in the Overberg leaving that entire coast free for poachers to plunder. There is no doubt that our scientific advisers are dead right in their biological analysis that because of rampant and unchecked poaching in the Overberg, closure of the last two zones in the area is needed to save abalone. But is closure the answer? I reckon that what we should be doing is the opposite. I would in fact increase the commercial abalone TAC … dramatically. I would perhaps start with doubling the TAC for the 2011/2012 season to about 250 tons and do the same again in 2012. I would look at what my fishery control officers (ie those troops on the ground) and organisations such as TRAFFIC and SEAWATCH are saying about poaching trends in Zones A, B, C and D (the closed zones and zones proposed for closure) and increase allocations in those zones. For example, I would allocate no less than 10 tons in Zone A, 145 tons in Zone B, 10 tons in Zone C and 10 tons in Zone D.
I know what you are thinking. I have not lost my marbles. The reality is that since I was head of fisheries management, the “best advice” I received has always been to cut quotas when a resource is not doing well for whatever reason. The same applied and continues to apply to abalone. The small difference back then was that we had the resources to start reducing abalone poaching. Not now. DAFF is resourceless with no known options to reduce poaching. In 2004, all scientific advice pointed to the need to reduce catch limitations in the Patagonian Toothfishery which was being subjected to significant levels of poaching. However, based on consultations with toothfish right holders, the South African government elected to instead leave the TAC unchanged in order to encourage year-round legal fishing in the area in order to try and displace illegal fishing. It is along these lines that I am suggesting that instead of abandoning an entire coastline to poachers, keep the legal fishery active in a bid to displace poachers and particularly syndicates. The reality is that after some 8 years of being closed to abalone fishing, Zones C and D have shown no recovery. Yet, it is known that significant poaching of lobsters and abalone continues in these zones. My proposal would be to establish a formal working relationship between the abalone industries located east and west of hangklip, on the one hand, and DAFF, TRAFFIC and SEAWATCH on the other, with the latter organisations providing a comprehensive monitoring and evaluation capacity monitoring fishing and poaching trends on a weekly basis to determine the trajectory of this project. Should the M&E system indicate potential biological calamity (the criteria for which are agreed to beforehand of course), the Minister always has the authority to suspend fishing, reduce effort or reduce the TAC on a zonal basis on an emergency basis under section 16 of the Marine Living Resources Act. The usual approach of reducing TAC’s and closing the legal fishery has only served up more and more of our abalone to syndicated poachers. I reckon its time for a radical option. What do we have to lose? 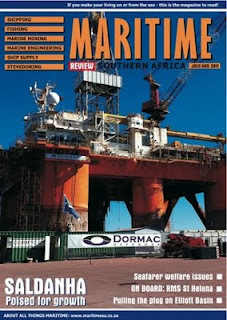 Feike and some of the work we do in South Africa is featured in the July/August edition of Maritime Southern Africa (pages 56-57). The electronic version can be viewed on http://maritimesa.co.za/CurrentIssue/tabid/79/Default.aspx then simply click on the magazine and flip to page 56. Feike’s Shaheen Moolla will be chatting to Bruce Whitfield on The Money Show between 19:30 and 20h00 on Thursday 11 August 2011. We will be talking about the state of the SA fishing industry with particular emphasis on the larger commercial fisheries such as hake deep sea trawl and the small pelagic fisheries.